Proper breathing is something that should not be disregarded. It can provide you with a number of benefits that you should not miss. All in all, having accurate knowledge about proper breathing techniques is beneficial for your optimal wellness. 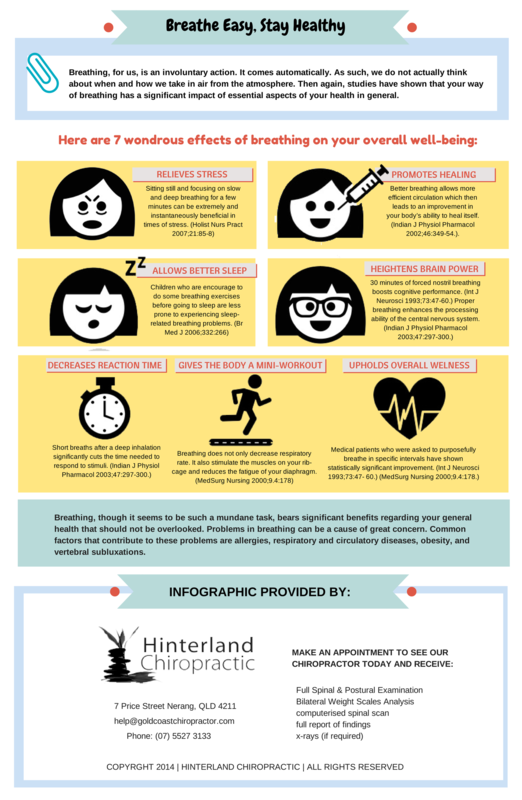 Here is a set of more detailed information about how breathing can help your keep your mind and body in perfect condition. If you have difficulty in breathing correctly, this can be due to a number of factors like other medical conditions that you are experiencing. Furthermore, this can also be caused by vertebral subluxations. You don’t have to worry about anything though. Your trusted Gold Coast chiropractor at Hinterland Chiropractor can help you on your way towards utmost overall health. Your gentle chiropractor in Gold Coast can provide you and your entire family with safe and effective Chiropractic Care, as well as complementary services such as Massage and Nutrition Counselling, which are all intended to help you active and maintain perfect health. We have been helping families in Nerang and all around the Gold Coast enjoy a much better quality of life for over 18 years now.